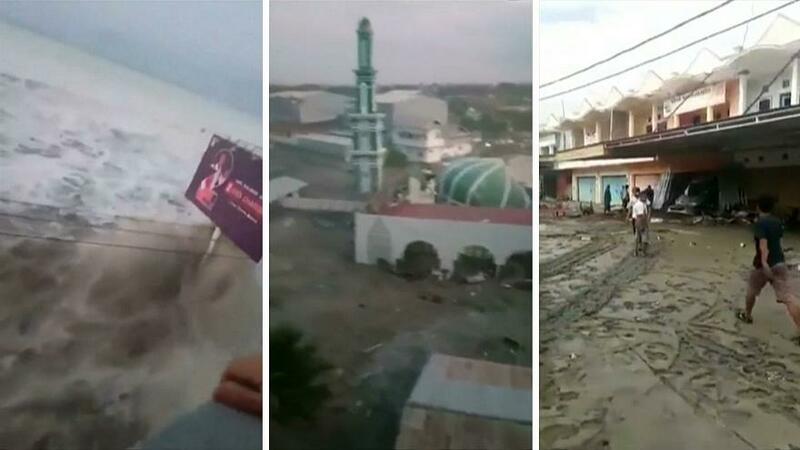 JAKARTA, INDONESIA (BosNewsLife)-- Christians in Indonesia's quake-hit Sulawesi island say they experience miracles amid the devastation, including the death of dozens of children at a Christian camp. In one location a church is the only one building standing. Elsewhere, a Christian pilot claims the Holy Spirit made him leave three minutes early from Palu airport which moments later was hit by last week's 7.5 magnitude earthquake and subsequent tsunami waves as high as six meters (20 feet). “All day Friday I had been feeling unsettled, and I didn’t know why,” explained Captain Icoze Mafella while speaking at a Jakarta church, Duta Injil BIP, on Sunday, September 30. To displace his feelings of unease, Captain Mafella – a devoted Christian – began to loudly sing worship songs on his flight from Ujung Pandang to Palu. “Usually I only hummed, but that day I wanted to praise the Lord as best I could,” he added. “I think you should make a CD of worship songs,” his Muslim co-pilot told him, jokingly. After they landed, the Holy Spirit prompted him once more that he needed to be quick, he claimed. He instructed his crew to take a shorter, 20-minute break before the plane was due to take off for Jakarta via Ujung Pandang. “I didn’t even leave the cockpit and requested permission from the control tower to depart three minutes ahead of schedule,” Mafella recalled. That early departure of his Batik Air flight from Palu averted a potential disaster with the loss of many lives. "If I had taken off three minutes later, I would not have been able to save the 140 passengers, because of the asphalt on the landing strip was moving up and down like a curtain blowing in the wind." He praises the Indonesian air traffic controller whose last act before he died was making sure his plane safely escaped the earthquake and tsunami. Anthonius Gunawan Agung, 21, was at the control tower of Palu airport as Mafella's Batik Airways plane was on the runway. "I was rushing to leave. There was a voice in my head that told me, get out of here immediately," said Mafella, 44. "I told my crew and the ground crew to speed up." At 18:02 local time, less than a minute later, the 7.5 magnitude quake struck. As the control tower started to shake, people around Agung fled, but he watched to make sure the plane was airborne. His last words were "Batik 6321 clear for take-off". Then, finding his way out blocked, he jumped from the crumbling tower, several reports said. He died while awaiting treatment. "He is our national hero," stressed Mafella. Though Mafella and other believers survived, many Christians are among those who died. The human remains of at least 34 children were inside a church in a remote northern region of the Indonesian island of Sulawesi following Friday’s devastating earthquake and tsunami, the Indonesian Red Cross said. The grim discovery was the latest heartbreak in an intense recovery effort as the death toll climbs to over 1,400. These children appear to have been attending a Christian Bible camp when they died, Red Cross spokeswoman Aulia Arriani told reporters. While 34 were accounted for so far, Arriani warned that they might find more bodies. With no heavy machinery available in the remote region of Sigi, there's no way to lift the concrete rubble and dig through the carnage. Widespread damage is also along the coast, where houses, cars, and people have swept away in the tsunami waves. Volunteers in Palu have begun preparing for a mass grave with enough capacity to bury more than 1,000 people. The number of dead is likely to rise as several response teams reach damaged roads in the affected areas, many of which have been ripped apart from the tremor and littered with debris. The United Nations announced a $15 million allocation to support relief efforts, saying more than 200,000 people were in dire need of assistance. And The Netherlands, Indonesia's former colonial master, already pledged 1 million euro, while other European countries and the European Union also allocate millions. More than 70,000 homes are thought to have been wrecked by the quake, demolished by the tsunami or engulfed by mudslides. Thousands of people are sleeping in tents or in rough shelters made from debris, unsure when they’ll be able to rebuild. Many spend their days trying to secure basics like clean water and fuel for generators. Others search for their loved ones. Anisa Cornelia, 22, was supposed to marry the love of her life — the man she was supposed to marry this month. She met her fiancé, 25-year-old Iqbal Nurdiansyah, seven years earlier through friends at school. She was attracted to his warm personality, his bushy eyebrows, and his handsome face. The tsunami separated them. "I still want to marry him, even if God returns him with a disability, no hands or blindness," she told The Associated Press news agency. "I can see for him, as long as I am healthy."